When developers wind up spending most of their time identifying and troubleshooting issues, their ability to innovate is ultimately jeopardized. This scenario became all too familiar for Hyatt Hotels, one of the largest hospitality companies in the world. To continue to provide guests with a seamless customer experience without squandering their developer’s time, they turned to a platform that delivered real-time visibility across the company’s 700+ environments. 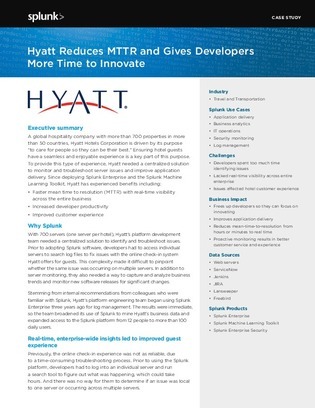 Keep reading to learn more about this platform, and find out how Hyatt was able to use it to interconnect multiple data sources, including Jenkins, JIRA, Lansweeper, and more.